I decided that I want to try to finish 4 rows of this quilt for the next four weekends - so we'll see how I can manage to do. The outer dark just shows a dark binding. I'm not planning on actually putting a tiny dark border way out there. I just want the stripes to float on the white. This is a 16x16 layout. I'll try to finish this one by working on it on the weekends for the next three weekends. Because I'm using smallish string blocks, It doesn't take a whole lot of time to make each block. Then, because they are half square triangles, I actually don't need to make as many string blocks as you might think. I. 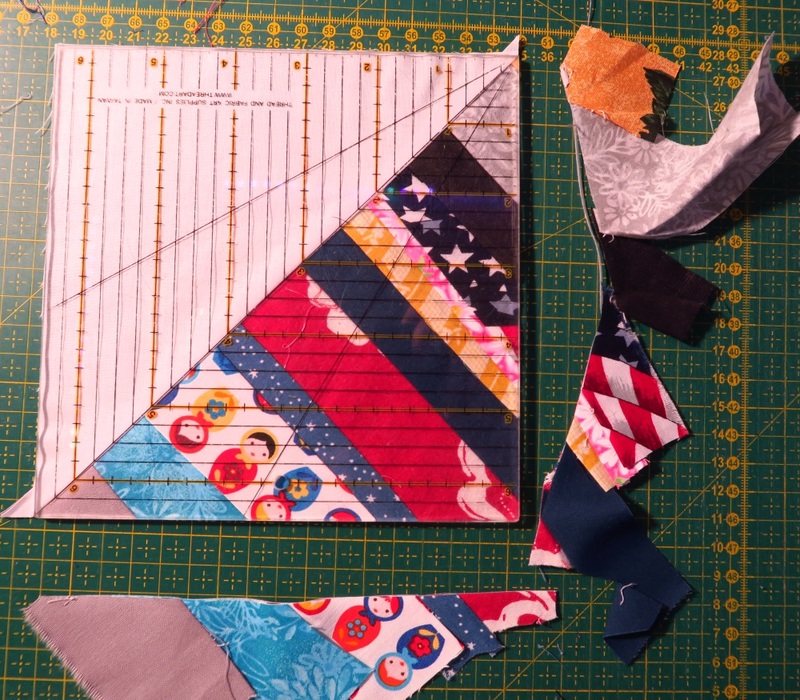 Cut out 7" interfacing squares. I cut out about 26 I suppose. 2. Pieced 22 string blocks using those interfacing pieces as a base. I had 10 done from last week. 3. 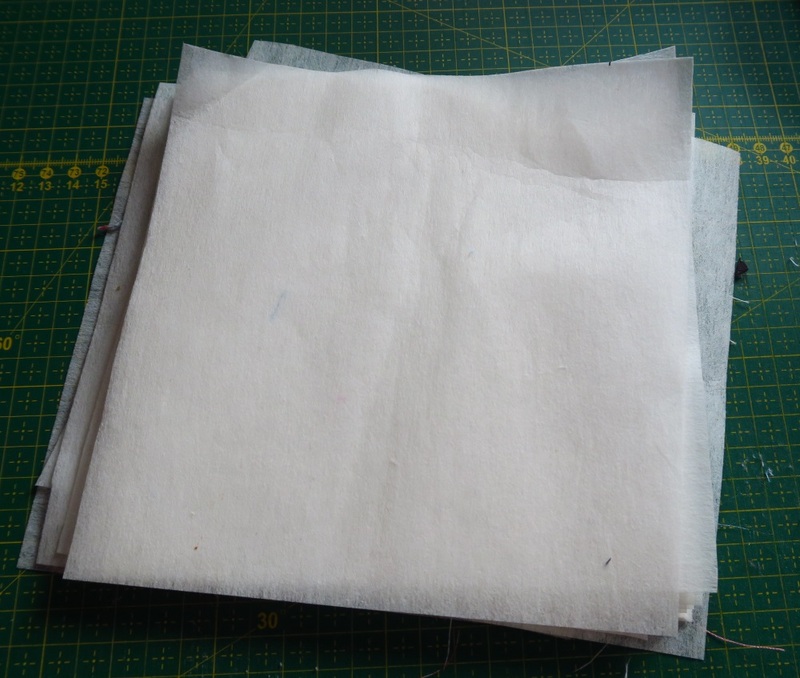 Cut out lots of 7" white squares from cotton fabric. 5. Placed a white square on top of a string block like this. I know it is untrimmed. I decided to try it without trimming the block down, thinking that it would save me a step (and thus, time) if I could just trim once - after I sew the white to the string block. 6. 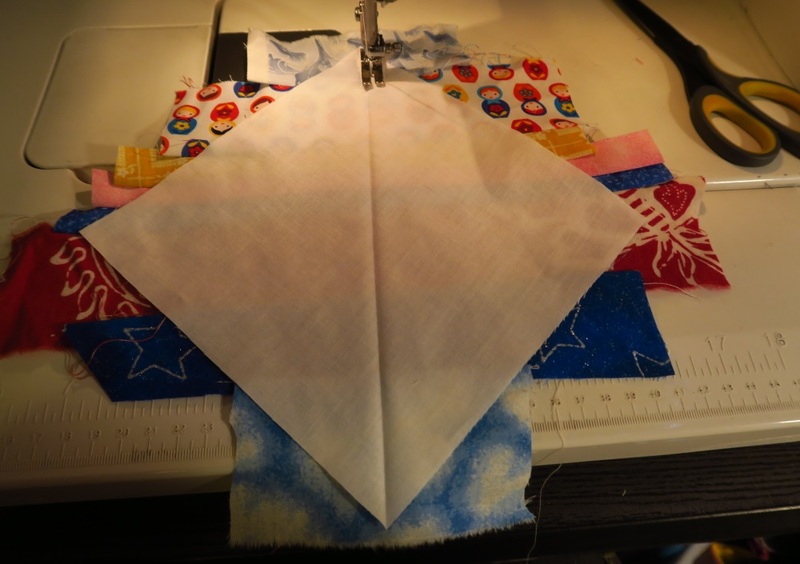 Sewed on either side of the pressed line, aiming for 1/4" or less. 7. Cut them apart between the lines. I have 64 trimmed blocks here. 10. Made 4 strips of 16 blocks as per pattern. 11. 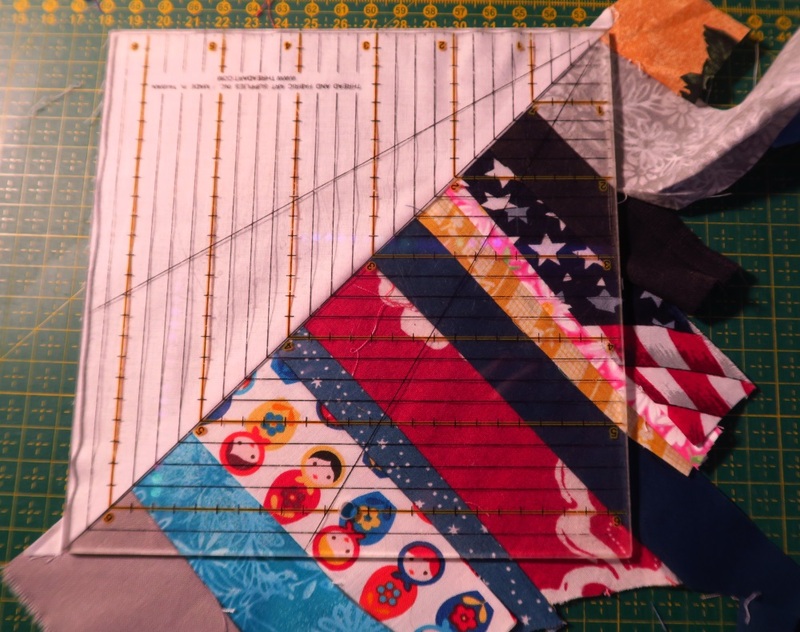 Put together those 4 strips to make the first four rows of the quilt. 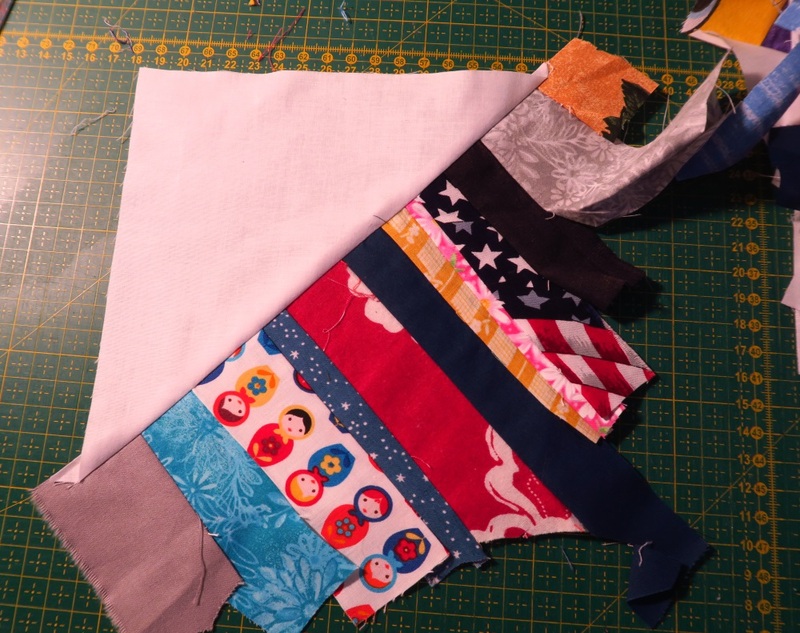 These scraps are primarily from the latest quilts I've done - so the Wedding Quilt, the three for the girls in Central Asia, and the backing for a couple you haven't seen yet. I knew I needed a total of 64 blocks. This meant I needed 32 strings blocks as I was making half square triangles (hst) out of them, so each string block ended up making 2 hst blocks. I will be repeating this for the next 3 weeks, hopefully. This will allow me to finish this quilt top in a month or 4 weekends. I'm still thinking about what to do with the strips placed on the paper tape. I just honed in on these string blocks and didn't spend time thinking about those. They will continue to sit there while I consider them. So what do I think of using interfacing for the base of these blocks? I like it. I don't have to tear it off like paper, it doesn't dull needles, they don't stretch like they do if you use nothing and it is pretty quick and easy. It makes the quilt top a lot lighter than using fabric - especially since I've used up all my really flimsy fabric already on previous strings blocks, so the only fabric I have to use is a bit heavier than I'd prefer to use. Plus, I only have to pay about 80cents a meter/yard for it, so it's not a big cost for me. I think it's a good choice for me. And that is what I did with my strings this weekend! I am very pleased with the look so far! Be sure to check out what my sis has for over in the store! She's working hard to keep you in affordable fabric!